Ariana Grande reveals her celebrity style icon... And you'll be surprised! | HELLO! Ariana Grande reveals her celebrity style icon... And you'll be surprised! When we asked Ariana Grande who her celebrity style icon was, we weren't quite expecting her answer to be Audrey Hepburn. 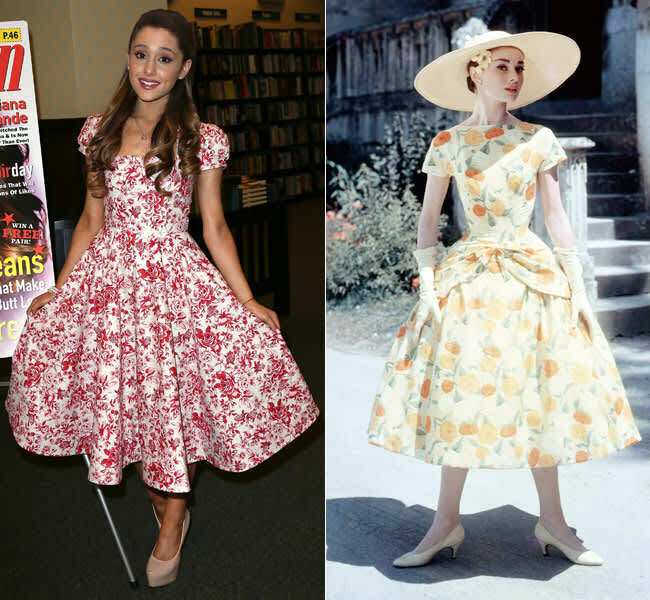 But it totally makes sense – Ariana is known for her cute, fun and flirty style that we reckon is actually a modern update on Audrey's iconic fashion sense and her love of full, floral dresses. "My favourite style icon of all time has to be Audrey Hepburn for her timeless look," Ariana told us as she launched her new collection with Lipsy. As for her favourite fashion look right now? "That's a tricky one!" she said. "I love a skater skirt and crop top. I think that's kind of become my signature look." Having been in the spotlight since she was 15 years old, Ariana admits to having "too many fashion faux pas to choose from!" One style moment that she considers a highlight, however, is her Grammys look. "I loved my Grammys look this year," she told us as she launched her new collection with Lipsy. "I knew I wanted a red dress so when I saw the Romona Keyeza gown, I was so excited – it was just perfect. "I loved the fishtail and the little buttons up the front and the colour was just so striking." It was recently revealed that Ariana was followingin the footsteps of the Kardashian sisters by being the latest celebrity to collaborate with British clothing brand Lipsy. The pop princess' collection is heavily influenced by her own fun, flirty style, featuring cute strapless prom dresses and floral skater styles. "It's so great getting to collaborate with Lipsy to do something special for my fans," said Ariana. "The line is youthful, affordable and I know my fans will love it." The collection is available now at Lipsy.co.uk and Next.co.uk, followed by a summer edit in May. Gary Oldman reveals how he proposed to new wife - and you'll be surprised!